Guinea pigs can be messy creatures. Their nesting instincts, playing habits and and other behaviors can cause a mess, leaving their bedding scattered everywhere but their cage. Changing bedding and modifying your guinea pig's cage can make a huge difference in preventing future messes. 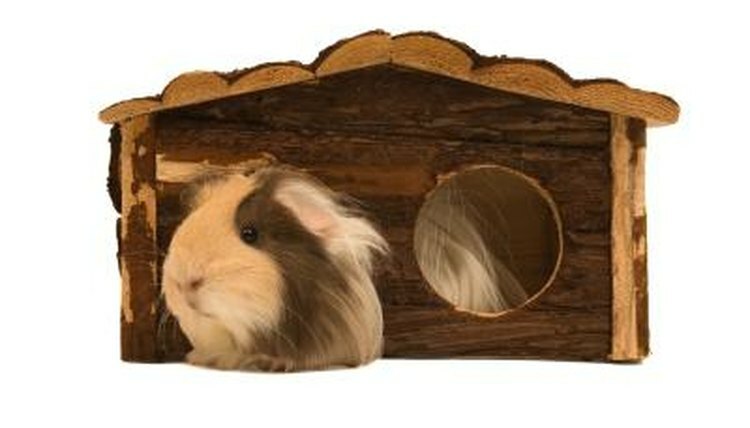 Many guinea pig owners use a loose cage filling that is sold at pet stores. This is a quick and easy option, but if your guinea pig has a problem with throwing their bedding everywhere, using washable fleece squares can keep their cage a little more orderly and leave less of a mess from filling spilling over the edges of the cage. This will allow you to eliminate the loose filling entirely, or you can use the loose filling just in the bathroom area of your guinea pig's cage for easier cleanup. Changing the depth of your guinea pig's cage can work wonders for keeping your guinea pig's cage filling inside their cage where it belongs. If you have a modular cage, side barriers can be purchased inexpensively and will keep much more bedding from being tossed outside the cage when your cavy runs around excitedly in their cage or nests. There are some expressions of guinea pig emotion that can lead to a big mess. Behaviors like popcorning, where an excited guinea pig will run and jump excitedly, often leaving a mess of bedding in his wake. This isn't something an owner can control or prevent, in fact the more your guinea pig is popcorning, the happier he is. There are times in a guinea pig's life when they will need additional filling in their cage. When a guinea pig mother is about to give birth, you probably will notice her creating a nest in a corner of the cage or inside her house. Let her make her nest and leave it undisturbed so she can have a comfortable place to give birth. This nesting may mean you should add more filling into her cage than usual, to make sure she has enough for her nest as well as using the restroom and playing for her or other guinea pigs that share the cage.